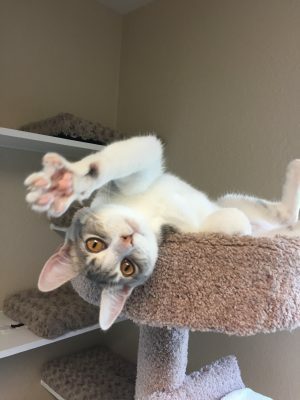 Onion Creek Kennels is happy to provide a fun and unique environment for our feline guests. Every cat has an exclusive habitat with three different compartments. Each kitty compartment is 2 feet by 2 feet, offering plenty of room for all the needs of your pampered pet. Each habitat is outfitted with a fleece bed for cozy sleeping and lounging. We would like to follow your cat’s normal diet, so please bring your own food. Otherwise, we offer Fromm Grain Free Game Bird dry kibble, at no additional charge. Medications can be administered provided that it is provided in the original bottle and is clearly labeled by your cat’s regular veterinarian with instructions. In case veterinary care is needed, we will contact your veterinarian. If your regular veterinarian is not available, we will transport your pet to a local 24-hour Emergency Veterinary Hospital. We provide plenty of comfy bedding and toys for your favorite feline. You may also bring added belongings, provided that they are clearly labeled. We recommend that all felines arrive to our cattery enclosed in their favorite carrier. We will happily store this for you until you return. Overnight Feline boarding is $20.00 per cat per night. A package of 10 cat boarding nights can be purchased in advance for $180. An additional fee of $18 applies for cats picked up after 1:00 PM their final day of boarding. We require current Rabies and FVRCP vaccinations. The most current records from your veterinarian may be emailed to onioncreekkennels@gmail.com. Otherwise, current vaccination records must be present upon arrival. Payment must be paid in full before pet’s departure. We accept cash, check and all major credit cards for your convenience. For reservations, please call us at (512) 312-0595 or email us at onioncreekkennels@gmail.com. *All feline guests must be spayed or neutered.